It has been way too long since my last update to the site. I would not mind going back to that day, right before my family’s renewed annual vacation down the shore. Having accomplished weight loss of sixty pounds, I really enjoyed the opportunity to get to the beach and treat myself. Treating myself really meant all kinds of fun bike rides, long runs and plenty of boardwalk ice cream. I succeeded in blowing away my previous best time on a roundtrip bike ride from Ocean City, NJ to Cape May, NJ and running the length of the Ocean City beach one morning. Upon my return to work, I really focused on just managing or maintaining my weight, so to not fall into the common trap of gaining right after achieving a goal. I also had a number of competing priorities that hopefully will result in some great news in the coming months. As a result, I had every reason to stay vigilante around my intake and exercise, given limited time and energy to expend. Two months later, I have lost a few more pounds with ease, suggesting I juggle many responsibilities without continuing what was an exhausting regimen. As the intensity of my workouts has subsided, certain elements around my vitals have changed, most notably my Resting Heart Rate. At its best this year, my RHR fluctuated from mid to high 40’s. Without the hour and a half runs or breakneck speeds on the bike, my RHR has risen to around 51 BPM. It’s frustrating, and something I would like to address over the next month or two, as some of my commitments from September have run their course. 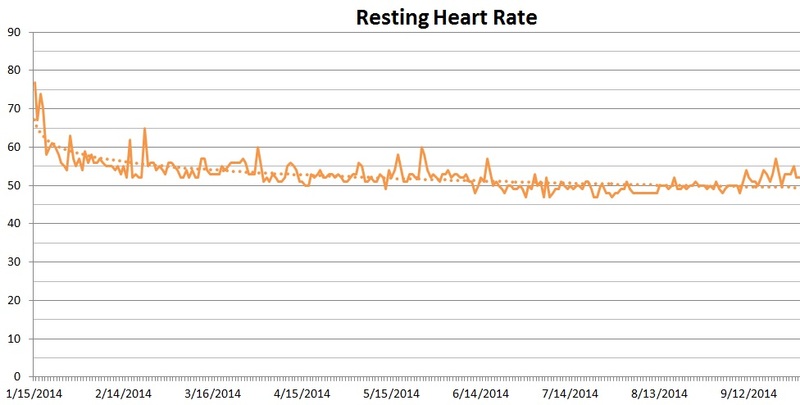 And yes, I know I am being pretty ridiculous, as 51 BPM is still an exceptional resting heart rate. I have completely let my sleep schedule be ruined by pressing deadlines (non-work) and my inclination to sometimes do too much. I should address my sleep patterns in the coming weeks as well. I sometimes forget I have all this sleep data to review, as I rarely think about the watch on my wrist at night. Interestingly enough, I was contacted by Basis to beta test their new prototype, which all signs point to being the Basis Peak. The video is awesome (and I love the driving strings in the background) and the device appears to address so many requests by users: waterproof, thin, aesthetically sharp, LED lights, Heart Rate monitoring during peak performance and integration with smart apps. EDIT: Basis reached out to me regarding a question I had about the difference in design, specifically as it relates to charging. They provided a reasoned explanation as to a design decision to no longer support simultaneous charging of the device while being worn. The trade-off was necessary to support a true waterproof capability, one that I think makes more and more sense as I consider the opportunities. In any case, I really am excited for this next generation of their product. So I look forward to my opportunity to test it out personally and then collect my thoughts. Side note – Because I found it mildly humorous, I realized the other day that I look at my Basis watch too much in such a way that creates awkwardness in social settings. Note to self, when someone holds the elevator for someone else, looking at my heart rate on my @mybasis comes off as if I'm impatient. With summer in the books, my favorite season really did feel like a blur. All the trips to the beach, the bike rides to and from the suburbs, and the late night runs on Kelly Drive have come to an end. I do plan on a number of bike rides over the next two months, while Fall is tolerant of outdoor activities. I have not been on my bike for a few weeks, the longest period since March. I miss it, and it was out of necessity that I stuck to running these past several weekends. Other commitments all were priorities and can finally be put to rest as I wait and see for outcomes in the next few months. It’s funny too, as I have a drafted post that I never published (one of many) about how I redefined my commute from the suburbs to the city through my bike. For awhile there, I would ride every weekend 62 miles roundtrip, completing the 31 mile one way ride in ever faster times (topping out at one hour and fifty minutes). Now I recognize that these rides will become rarer as the days become shorter. The change in daylight really is severe and I can feel the energy of Kelly Drive being sapped from what was a very busy set of trails. I will make it a point to run along the new Boardwalk on the Schuylkill, but I know that before long, no one will want to go outside. I think I may combat this inevitable turn by running during lunch. I also am considering what I could do to embrace the elements when the weather really turns. I think I could get knobby tires for my road bike or potentially fix up my old mountain bike. I will buy some thermal riding clothes, as I want to keep up the rides even as the trails no longer are maintained. I guess I’m just so not ready to embrace the cold after last year’s winter. I also am curious as to how my body reacts to the cold, as I have found my lower body fat percentage limiting when it came to swimming for hours on end in the ocean in August. I am the type of guy who would stay in the water for eight hours at a time if I could during those August days, and now I cannot stick it out any longer than an hour and a half. My dad made a good point that it may be an even greater challenge to adapt to the colder temperatures of winter. Let’s just say I would not mind some unusual warm weather over the next month or so. Being Impulsive: My first Half Marathon is Sunday! Fight Childhood Obesity – Broad Street 2015!